Winterson's latest children's book is a portrait of seventeenth century London. The tale of Jack Snap's misadventures battling the Magus, a megalomaniac alchemist, brings the city to brawling, stinking life. Young Jack is about to become a printer's apprentice on the Strand until he is kidnapped and trapped in 'The Dark House', a creation of the Magus's imagination which is firmly situated within the geography of London. This is the enduring strength of the book. The fantasy and remote historical setting is anchored time and again in the familiar boroughs, streets and markets of the London we inhabit today. On a night cloaked in "...a silence as thick as cloth..." we are taken to meet Mother Midnight, a mercurial witch-like creature as old as time, who dwells in a hovel tucked away somewhere in Southwark. There is a pleasure that pulls the reader in with a tug of familiarity and recognition at each mention of places such as Billingsgate, Spitalfields, Vauxhall and St Paul's. The Magus' demonic plan is to turn the entire city to gold, even "...the Thames itself a flowing golden god..." It is in part a prophetic tale of what a world fuelled entirely by avarice will become; sparkling but uninhabitable. When the city is transformed from "...a vast seething forest, made out of people and wood..." into a cold metallic wonderland, bedlam soon takes over. With a river of gold, eggs of gold and cows of gold, there is nothing left to eat or drink and riches beyond imagination quickly become worthless. It is an allegory of what our urban world could so easily be, or even what it already is. The book is never patronising, the fluidity of time is toyed with but never fully unfolded and the language is simple but sometimes arrestingly beautiful—our city's artery is described as "...a silver thread drawn through a dark cloth." The monsters of the fairytale are gender-bending bottle made freaks, and the winning moral of the story is that we are each as much of a layered palimpsest as the ancient, ghost-ridden city itself. 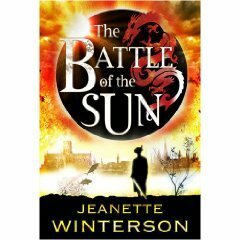 The Battle of the Sun By Jeannette Winterson is published by Bloomsbury.